Geneva – IOM, the UN Migration Agency, reports that 33,400 migrants and refugees entered Europe by sea as of 6 June 2018. So far this month, 1,190 arrivals to Italy, Greece and Spain have been recorded, the majority of which arrived in Spain (47% of total European arrivals). The 33,400 arrivals since 1 January this year compares with 73,078 arrivals across the region through the same period last year. The number is also significantly lower compared to 6 June last year, with a 55 per cent decrease. IOM Rome’s Flavio Di Giacomo noted that the 13,808 migrants who are registered as having arrived by sea to Italy this year is 77.44 per cent lower than that reported last year in the same period, when 61,201 irregular migrants and refugees arrived in Italy and an 80 per cent decline from the 70,222 arriving to this point in 2016. Arrivals to Italy through May are just over one-sixth of last year’s May volume, and one-fifth of that of May 2016 (see chart below). Di Giacomo also noted that the main nationality of sea arrivals to Italy from 1 January to 30 April this year is Tunisian (1,910) followed by Eritrean (1,810). In the same period in 2017, the largest number of arrivals registered were of Nigerian origin (5,253) followed by Guinean (4,184). IOM’s Kelly Namia reported that as of Tuesday, 5 June, 11,236 migrants had entered Greece by sea, an increase of 51 per cent compared to the same period last year. 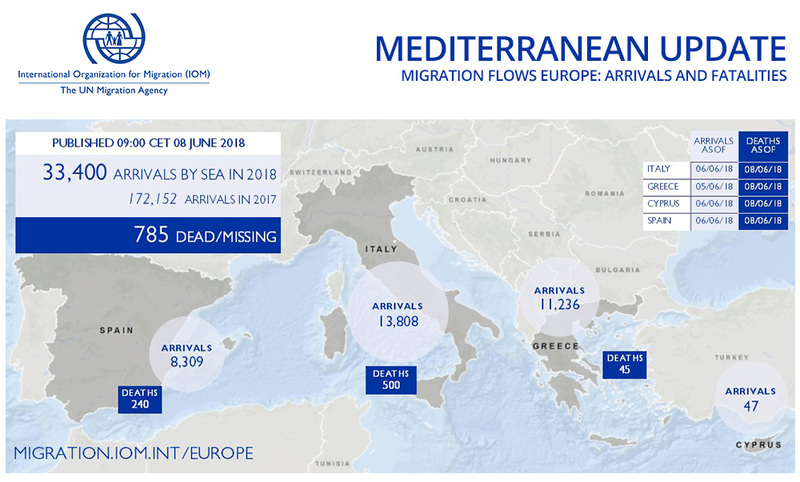 In Spain, IOM’s Ana Dodevska reported that as of 6 June, 8,309 migrants have been recorded to enter the country via the West Mediterranean route in 2018, with 240 deaths. Only in the first week of June, IOM has recorded 561 sea arrivals. With a higher number of June arrivals by sea than in 2015 (414) but lower than in 2016 (715) and 2017 (2,352), the number of sea arrivals to Spain per year has been growing steadily since 2015 (see below). Intensified movement through the Western Balkans continued throughout May reaching a monthly total of 2,838 registered migrants and refugees in Bosnia and Herzegovina, Montenegro and Albania – the highest figure reported since the beginning of the year. Between January and May 2018, authorities in Bosnia and Herzegovina, Montenegro and Albania reported the arrival of 7,402 new migrants and refugees. More than half the migrants and refugees were registered in Bosnia and Herzegovina – a total of 4,841. There were estimated 520 new migrants and refugees arriving in the country every week. Almost half of all individuals registered in Bosnia and Herzegovina this year were from Pakistan (22%) and Syrian Arab Republic (22%) followed by those who declared Afghan (14%), Iranian (10%) and Iraqi (8%) nationality. Since the start of the year, authorities in Montenegro have registered 1,362 migrants and refugees, mainly from Syrian Arab Republic (46%), Pakistan (13%) and Algeria (12%). In Albania, there were 1,199 migrants and refugees registered this year. Among the three countries, only authorities in Albania reported a decrease in arrivals this month – from 293 reported in April to 147 reported in May. However, DTM flow monitoring activities in the north of the country indicate an increase in movements towards Montenegro. In May, authorities registered 139 migrants and refugees on exit from the country (Shkodra region), a 200 per cent increase compared to only 40 reported in April and 10 per cent increase compared to 126 identified in March. On 6 June, 17 migrants were returned to Libyan shore by the Coast Guard in Sabratha. Seeking a better life and work opportunities, nine men, seven women and one boy embarked on a wooden boat in Zuwara. The migrants originated from Ghana, Niger, Mali, Nigeria, Côte d'Ivoire and Sudan. Upon disembarkation, the migrants received basic medical assistance. There were no reports of casualties. So far in 2018, 6,852 migrants have been returned to Libyan shore by the Libyan Coast Guard. Following disembarkation, the migrants were transferred by the Libyan authorities to a detention centre in Zintan. Whilst IOM advocates for alternatives to detention, IOM continues emergency assistance to migrants inside detention centres including health and psychosocial support, as well as Voluntary Humanitarian Return Assistance. Worldwide, IOM’s Missing Migrants Project has recorded 1,401 people who died or went missing while migrating in 2018. In the Mediterranean alone, 785 people have lost their lives at sea since the beginning of 2018. Last Saturday, a boat carrying approximately 180 people capsized off the coast of Kerkennah island, in Sfax, Tunisia. As of Thursday, 7 June, Tunisian authorities had recovered 73 bodies, 53 of them Tunisian nationals. An estimated 39 people remain missing. In the Gulf of Aden, at least 62 migrants died or went missing when the boat in which they were travelling from Somalia to Yemen capsized on 6 June. The remains of 46 migrants (37 men and 9 women) were recovered, while an estimated 16 remain missing and are presumed dead. IOM staff on the ground provided assistance to the 39 survivors who managed to reach the shore. There were several other additions to the Missing Migrants Project database since last Monday’s update. In Mexico’s state of Coahuila, a young man died after falling from a freight train near the town of Ramos Arizpe on 6 June. On the US-Mexico border, a 40-year-old man drowned trying to swim around the Tijuana border fence towards California. His body was recovered on 3 June by Mexican civil protection authorities. Additionally, the Missing Migrants Project team received data from the Pima County Office of the Medical Examiner regarding remains of migrants found in Southern Arizona in March and April 2018. In the past two months, the remains of 24 people who died while trying to cross the Sonoran Desert into the United States were brought to the Pima County medical examiner’s office in Tucson, Arizona.